This rough and tough green beats out all the rest in terms of nutrition, providing more antioxidants than most other fruits and veggies! It’s also a fantastic source of fibre, calcium, and iron. Prepare it virtually any way, from boiled to steamed, roasted or stewed. One cup of kale has only 36 calories, 5 grams of fibre and 0 grams of fat. Fibre aids with digestion, great for detoxifying your body and keeping your liver healthy. Kale is also bursting with nutrients, vitamins, folate and magnesium. Per calorie, kale has more iron than beef. Iron is essential for good health, such as the formation of hemoglobin and enzymes, transporting oxygen to various parts of the body, cell growth, proper liver function and more. Eating a diet high in vitamin K can help protect against various cancers. It is also necessary for a wide variety of bodily functions including normal bone health and blood clotting. Increased levels of vitamin K can help people suffering from Alzheimer’s disease. Kale is filled with powerful antioxidants and it is these antioxidants, such as carotenoids and flavonoids, that help protect against various cancers. Eating more kale can help lower cholesterol levels making it great for cardiovascular support. Kale is also high in vitamin A, which is great for your vision, your skin, as well as helping to prevent lung and oral cavity cancers. It’s high vitamin C content means that kale is very helpful for your immune system, your metabolism and your hydration. Per calorie, kale has more calcium than milk, which aids in preventing bone loss, preventing osteoporosis and maintaining a healthy metabolism. Calcium is also helpful to maintain cartilage and joint flexibility. The above is just a snippet into why kale is one of the most nutrient-dense foods on the planet. Incorporate kale into your diet and replace potato chips with the moreish kale variety. Once you start you won’t be able to stop! 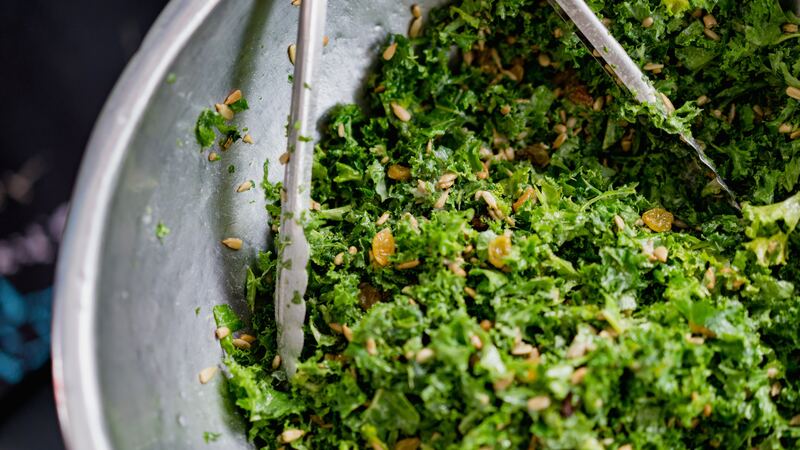 Click here to make our favourite coconut kale salad with the nuttiness of sunflower seeds and the sweetness of raisins.